Home » Model Horse	» The Website, BreyerFest 2017 Pickups, Videos and More! The Website, BreyerFest 2017 Pickups, Videos and More! Here’s to jinxing the new website server but so far everything is running great, wow! Thank you to all that helped us test out the new server. This is looking like it will be a good hosting service for us for the time being. We do have more grand plans for when and if the website really takes off but this is the most economic choice right now and should offer MUCH more stability than the past few months. We use GoDaddy for both our domain and web hosting. I was so very close to outing GoDaddy on their deplorable performance but they made it right as far as I’m concerned and we will stick with them for now. If anyone else uses GoDaddy and is having website problems, keep bugging them, be the squeaky wheel like I was and they may just fix it in the end! We installed caching on the website. GoDaddy’s built in cache was the original problem with our website. We installed a caching program that we have more control over and will hopefully work with our website. As always, please email us at aidanstoytrove@gmail.com if you encounter any website errors. Specifically, caching programs tend to have a problem with the Store Cart and Checkout. These are the areas that we are concerned with. We are aware with some glitching on the mobile website and are working to remedy it. You may notice that we started using Google Adsense with the website. If users find this to be too obtrusive, we will stop using it or cut down on the number of ads. As always, your feedback is appreciated! So that’s what’s up on the website front! Last week was rather interesting. We were without power, internet and cell service (we don’t have a ground line) for part of Thursday and most of Friday. This really put a damper on our productivity. It’s amazing to me just how much we depend on power and the internet! We had hurricane like winds that brought down a lot of our fence. We are a bit concerned about the roof as there were shingles flying everywhere but we have no way of knowing their origin. The barn where Miss Baya lives is on well water. The poor barn lady kept priming the pump every time the power blipped on only to go down minutes later. Those horses need their water! Breyer has revealed all of the BreyerFest 2017 Special Runs that they will prior to BreyerFest. The last Sneak Peek is yet to be fully revealed but we have a pretty good idea on the mold and have opened presales for him. 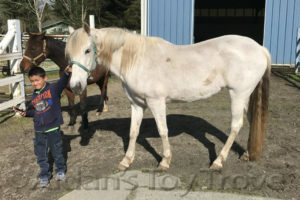 However, we won’t make an official listing on the website until the full horse is revealed. We have some great pricing going on for many of the 2017 Breyers. Please check them out. Lastly, we have a whole slew of videos that have been posted to Aidan’s Toy Trove YouTube Channel. There is some rare footage of my unpacking my personal collection Breyer Custom Horses. Unpacking Breyer Customs Part 1 features some of our larger horses. Unpacking Breyer Customs Part 2 features some of the minis. We also have some video footage of the amazing Breyer Horse Steampunk Creations created by the talented Elayne Watrus. 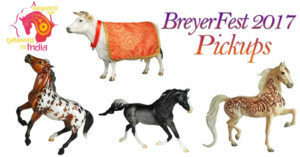 There a lot of other Breyer Videos (and Copperfox!) Please feel free to browse around our YouTube Channel. I’m looking forward to the end of the week and bet that you are too. It’s been a busy week! « Indu the Final BreyerFest 2017 Special Run Revealed!